Stats: Mo'Biscuits! 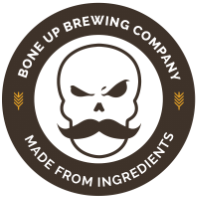 - Bone Up Brewing Co.
Color: The same brown you get from a marshmallow *right* before it catches on fire. Best Occasion to Drink: While sitting in the ball pit at McDonald's and trying to look nonchalant. Brewers' Notes: We partnered up with the Movember Foundation for this beer, so we obviously had to go with the manliest of beer styles: brown ale. It's the chest hair of beer - not everybody likes it, but it's here to stay so you might as well just roll with it and enjoy the ride.